My name is Peter Hicks and I was born in North Bay, Ontario. I grew up in North Bay and acquired my commercial helicopter license, I also obtained a private fixed wing licence at the local flying school with the intention of getting my commercial pilot’s licence. I could not find employment as a helicopter pilot due to fact the Vietnam war had just ended and there were lots of ex-military pilots looking for work. So, I decided to apply to the University of Guelph for a BA in psychology. It was my intention to get a PhD. While at the University I began to have problems swallowing, double vision, speech difficulties and poor balance. After going to many, many doctors it was discovered I had a non-invasive, epidermoid brain tumour about the size of an egg, on the cerebellum at the lower back of my brain. This was surgically removed in 1983. Later in 1986 I graduated from the University of Guelph with a BA degree in Psychology. While at University I was employed with the Ontario Ministry of Correctional Services part time and when I graduated I began working full time at the local Correctional institution as a Correctional Officer and later as the Program Coordinator providing various programs for the inmate population. But the tumour grew back again and in 1992 I had another major brain surgery to have it removed. I left my job and went back to North Bay to live with my parents because the residual effects of the brain surgery had severely affected my speech and balance making work in the prison very challenging. Over time my medical situation improved and I returned to Guelph where I secured a job working with young people in Probation-Parole Services and the local Detention Centre. I started at one day a week because that was all I could manage. This slowly increased until I was working four days a week. Then the tumor came back again and I required further surgery. Six years later, in 2001, I began having symptoms once more. My doctor recommended I have a shunt put in, a tube to drain the fluid off my brain. The following year I moved out to Victoria. My family had been very supportive through all this time. However, I wanted to live life on my own terms. I moved to the West Coast to pursue an independent lifestyle. I was not able to work when I moved but could manage on the long-term disability plan from my previous employer. In 2006 I was hit again with another tumor which had grown back and once more it was taken out. Then in 2011, I fell on two separate occasions damaging both my shoulders ending up in hospital for 9 months. In 2015 I had my fourth neurosurgery to remove the recurrent brain tumour. I had started doing motivational/inspirational public speaking about living with a disability when I lived in Guelph. I would talk to schools, Rotary Clubs, employers and anyone else who asked me. I set up my company, Peter Hicks Productions (peterhicksproductions.com). In 2005 I decided I would write my story up in a short book (“From Top to Bottom and Back”). I had hoped people in hospital facing life threatening surgery would be inspired and take hope from my story. In Victoria, I was not able to work but had to fill my days. I was President of the “Victoria Sailing Foundation” (a volunteer community group which provided a sail boat and staff so people could partake in the incredible sailing experience). 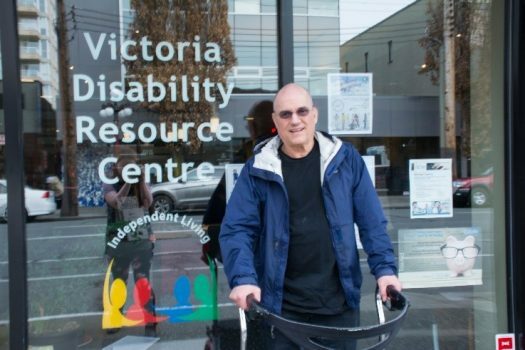 I was a volunteer board member with “Power to Be” (a Victoria/Vancouver based non-profit organization that empowers people to explore their abilities through inclusive nature adventures), the “Victoria Disability Resource Centre” and was the president of my strata council in the building where I reside. I attend the gym 4 or 5 times per week to maintain my physical health. I work three times per week with an exercise specialist. My recovery continues from my fourth neurosurgery. I have considerable experience to offer and want to give back as much as my health will allow. Independent Living is a philosophy of life that I, like so many others, embrace each day.